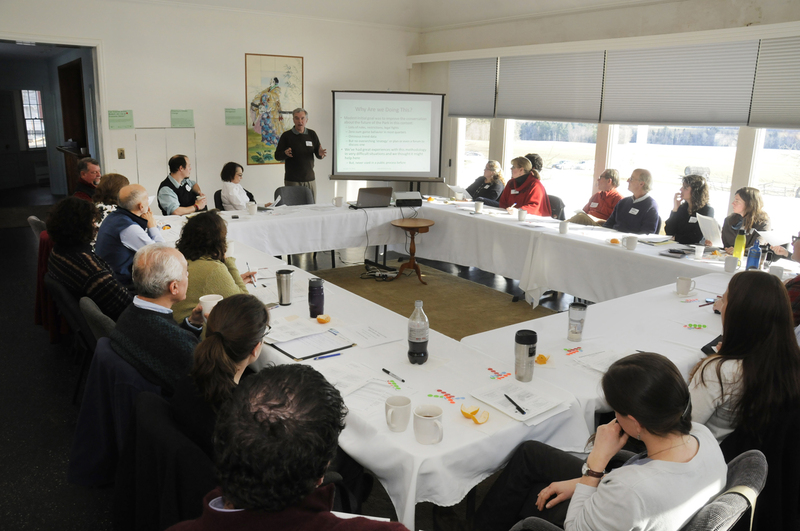 On January 23 we attended the summary presentation of the North Country Regional Sustainability Plan at the Wild Center. This is an effort out of NYSERDA, modeled after the Regional Economic Council process, to create an overarching plan for improving the economic and environmental health of the State. Like the broader economic councils, this effort was organized at the level of 10 regions across the State. The North Country effort was led by Essex County and included Hamilton, Clinton, Franklin, Lewis, St. Lawrence, and Jefferson counties. The place to start is with that over-used word sustainability. The key idea is that our communities, economy and Park lands are managed and used in such a way that finite resources are conserved and reused so that they will be available to future generations. This includes finding ways to be more efficient, i.e. using fewer resources, as well as using more renewable resources like the sun. Implicit in this definition is the need to limit green house gas (GHG) emissions which are the root cause of climate change and tied to non-sustainable use of fossil fuels. But sustainable, especially when applied to our communities and economic systems, also carries the connotation of strong, resilient and self-reliant. When it feels like many of our Adirondack towns are shrinking, sliding into oblivion and need regular infusions of aid from Government, the economy doesn’t feel very sustainable. One professor from Paul Smiths, Brett McLeod, suggested we talk about creating durable communities. We like that and suspect it will go over much better with many North Country residents than sustainable, which unfortunately is also associated in some people’s minds with liberalism, climate change and a plot by the UN to take over all private property. The sustainability plan, whose development was led by the team of ANCA and the consulting firm Ecology and Environment (E&E), was based on two main pieces of input. The first was a detailed inventory of current green house gas emissions in our region. This will serve as a baseline for both prioritizing future efforts and for measuring success at reducing our use of fossil fuels. The second input came from a fairly large-scale public outreach and stakeholder engagement effort. We participated in a couple of working group sessions as well as a major input session that brought all seven working groups together in an information sharing day. The GHG inventory has lots of interesting data and some good news for our efforts to become a greener economy. Because of the large amount of hydro and wind based generation of electricity, primarily in the St. Lawrence river valley, 94% of the electricity that flows through the power grid is generated from renewable sources. This doesn’t include the electricity that is generated by small-scale solar, wind or geothermal. This is a great place to start on a sustainability plan. Looking at our non-transportation energy use, 30% of the energy is produced by wood for heating, but this only contributes 1% of the GHG emissions. Meanwhile, fuel oil represents 35% of our energy use but contributes 48% of our GHG emissions. Similarly natural gas is 30% of energy use and 40% of emissions. Thus, a major strategy is to substitute biomass heating systems for those based on fuel oil and to some extent natural gas. At the residential level, there is a lot to be gained by converting the 39% of homes heating with fuel oil to high-efficiency wood burners, and this is a centerpiece of the ADK Futures strategy. The real problem is in energy use for transportation, which accounts for 40% of our GHG emissions (residential energy use accounts for only 17% of the total) and 42% of per capita energy consumption. Three quarters of this is for basic cars and trucks on the road. Farming, forestry, snowmobiles, ATVs and recreational boating account for 21% of transportation-related emissions. Strategies for reducing emissions due to transportation are much less clear as our large distances in the North Country require a lot of driving. Long-term efforts to encourage clustering of both businesses and residences in towns can help to promote walking, biking and use of electric carts. Unfortunately, the data says that in our region, the number of people living in a city or town center went down from 53% in 2000 to 46% in 2010. The real key will be getting people to use alternatives to single occupant vehicle traffic by building up bus systems and creating support systems for ride sharing. Surprisingly, the study estimated that 18.5% of commuters in the North Country travel via car pool, public transit, biking or walking. Presumably most of this is in the larger towns and cities outside the Blue Line. In our view, the GHG emissions due to transportation within the Blue Line can only come down significantly when we have affordable electric vehicles that have sufficient range to meet the needs of our dispersed region. Since our electricity is almost entirely based on renewables, this can be an effective long-term strategy. Use of biofuels may also be significant if technical breakthroughs increase the efficiency of their production. The proposals in these groups are very similar to those developed through the ADK Futures process: encourage more local food and local energy production, cluster development in town centers, use the land productively but in a sustainable manner for farming, forestry and recreation, protect the quality of our water, plan at the larger level of watersheds, use new technologies for water treatment that are energy efficient, and increase reuse and recycling of waste, especially for organic waste through composting and digesters. The data again has some interesting points. Energy usage by farms has not been a focus before and there is great potential to make them more efficient as only 1% of farms have ever done an energy audit. Although our solid waste disposal per person is 22% less than the State average, we are 4x less effective at recovering materials from the waste stream. DEC currently estimates that a quarter of the water bodies in the North Country are impaired in some way with pollution, invasives, acid rain, etc. 34% of North Country communities are considered “food deserts” by the USDA, i.e., you have to travel over an hour to get to a supermarket. We certainly applaud this major effort and look forward to seeing it refined into more concrete proposals for new investment, education and incentives from the State. This entry was posted in Energy, Uncategorized and tagged biomass fuels, conservation, economic development strategy, Sustainability on January 25, 2013 by ADKfutures.